LOUISVILLE, Ky. (Aug. 6, 2018) — Old Forester, America’s first bottled bourbon, will introduce its 18th Birthday Bourbon, the annual limited release created to mark the birthday of founder George Garvin Brown on Sept. 2. The 2018 Birthday Bourbon is the first iteration to be bottled at the new Old Forester Distilling Company, located in Louisville’s historic Whiskey Row — in the same space that Old Forester called home before Prohibition. Selected from a single day of production and handcrafted by Master Distiller Chris Morris and Master Taster Jackie Zykan, this small batch bourbon offers a one-of-a-kind character and flavor profile that will never be replicated. A total of 120 barrels, distilled on June 9, 2006, were marked for this year’s Birthday Bourbon release. They were drawn from two locations: 93 barrels matured together on the third floor on the northwest side of Warehouse J; the remaining 27 barrels matured together on the third floor, northwest side of Warehouse I. The angels opted for a hearty share of 2018 Birthday Bourbon – the total yield was just 39 percent and five barrels were found to be totally empty. The 2018 Old Forester Birthday Bourbon is offered at a suggested retail price of $99.99. Roughly 2,400 (six bottle) cases will be available for purchase nationwide. It is offered at 101 proof, the highest to date for this annually released bourbon. Rich mahogany in color, the nose on 2018 Birthday Bourbon is singularly focused with pronounced rich, dark cherry cobbler note that opens into a dynamic build of caramel and dark chocolate covered smoked almond with hints of charred oak. A touch of herbal lemon tea, sweetened with a touch of honey, round out its depth of character. The tasting experience is multi-dimensional, with subtle sweetness that blossoms into warm and green-spice, brightened by lemon honey and followed by cherry cobbler. The finish is long and dry, with an herbal lemon honey sweetness. 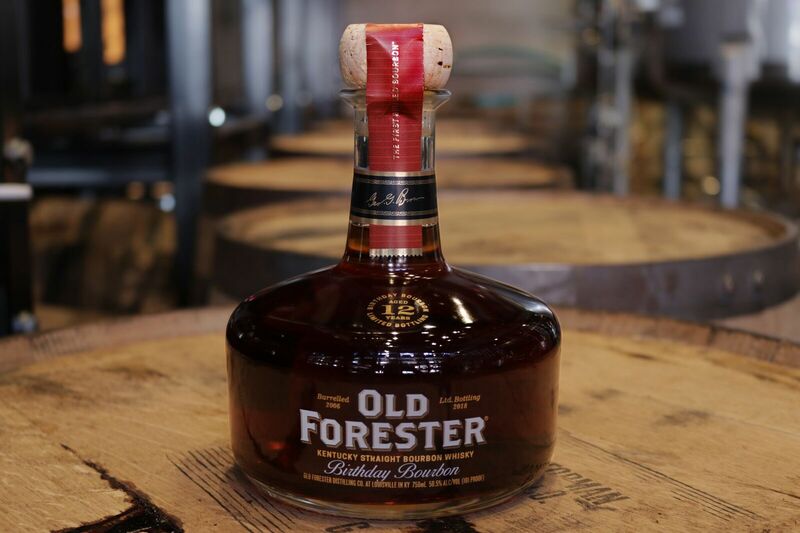 Since the first release in 2002, Old Forester Birthday Bourbon has been a darling among critics and collectors alike. Birthday Bourbons have received recent distinctions including Outstanding, International Wine and Spirits Competition 2017; Extraordinary, Ultimate Recommendation, Ultimate Spirits Challenge 2017; and Gold Medal at Whiskies of the World 2016.